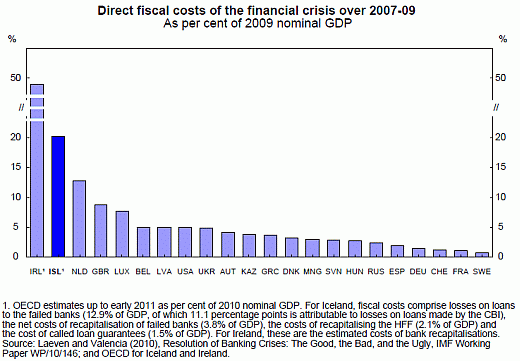 This chart shows the direct fiscal costs for the financial crisis in OECD countries between 2007 and 2009. Especially Ireland and also Iceland stand out as having relatively high costs in those years relating to the crisis. Notably the Netherlands is third and USA only comes in on the eight spot. In percentages the Netherlands is doing much better than Ireland, but if you translate this to real cost both the Netherlands and Ireland missed about $100 billion, Ireland just under $3 billion and the US over half a trillion. Although, I always try to save money for the emergency situations, but I had to apply for a payday loan when I decided to celebrate wedding anniversary of my children. It was too easy to get it done through the internet, as it enables using 24/7 application process with ease. Graphics are such tools which are widely used on surfaces like papers,canvas,screens and other medium to illustrate and inform about visual images and it is pictorial presentation of data. Use of graphs in dissertation writing service is helpful for students to quick review of this service.